Honestly, there’s no better shortcut to looking cool than by throwing on a leopard coat. Part rock & roll, part uptown chic, a feline print can instantly glam up your fall style game. And for as much as I wear it during fall/winter, you’d think I’d tire out, but nope! So not happening! How was your weekend? I spent Sunday decorating for fall with all my haystacks, punkies, spooky Halloween stuff and of course I had to light about a million apple scented candles throughout the house. I really do enjoy every second of this season, and hope you take time to enjoy it too 🙂 Have a great week!! 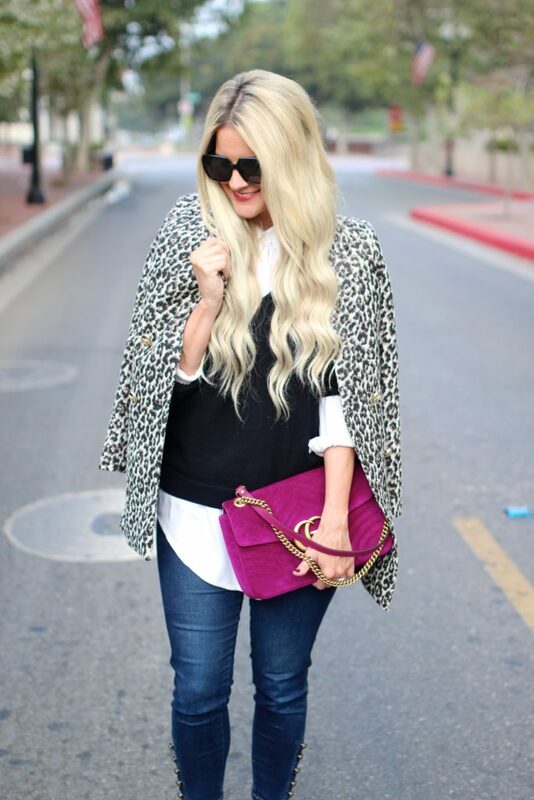 Very nice and trendy outfit, this leopard coat is masterpiece for this fall! We entered fall in Belgium with a lot of rain and wind … but this week will be much better as sun will come back soon! Umm, I think we are blog twins! Last week we had our black lace camis and today we’re rocking the leopard print! I love it 🙂 That coat is fabulous! 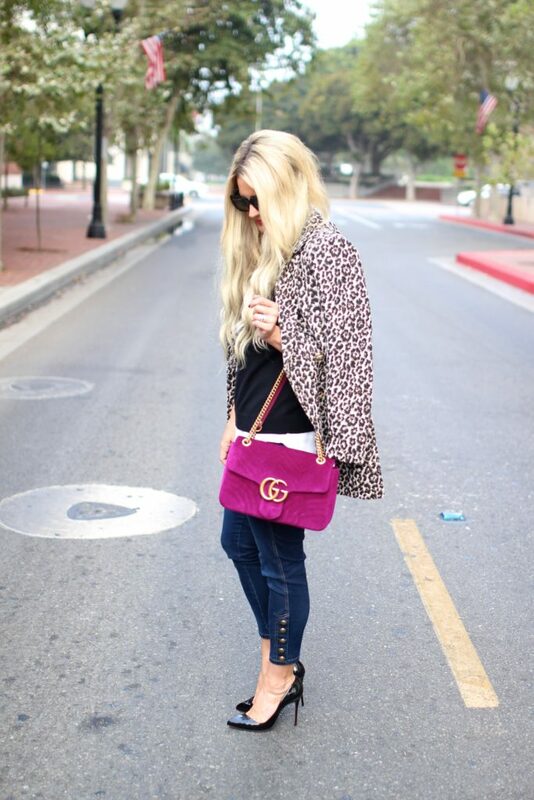 LOVING that leopard jacket especially paired with that gorgeous bag!! Happy Monday! I completely agree with you, animal prints can make any look so fabulous! 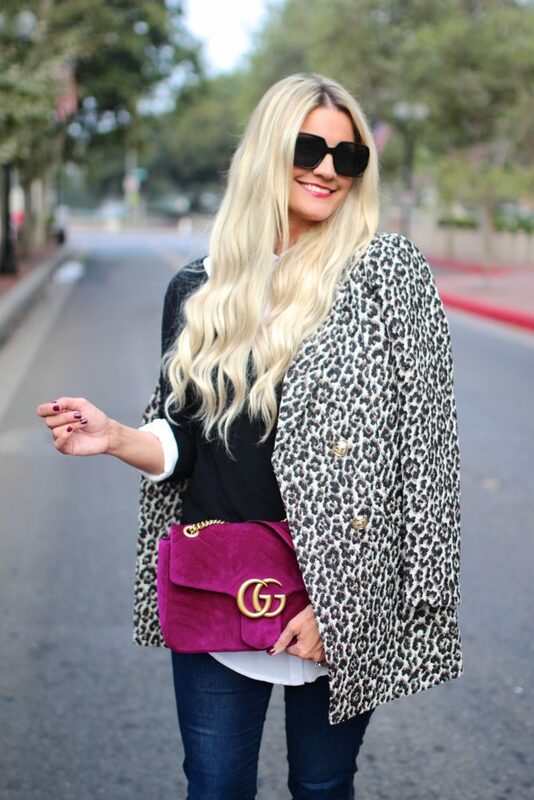 I have been on the look out for a new leopard coat, and this one is on the top of my list! Love your pop of pink Gucci too! I’m absolutely loving the Leopard trend this year. This outfit is so chic from head to toe. This outfit is everything!! I love the leopard blazer with your handbag!! Great combo!!! 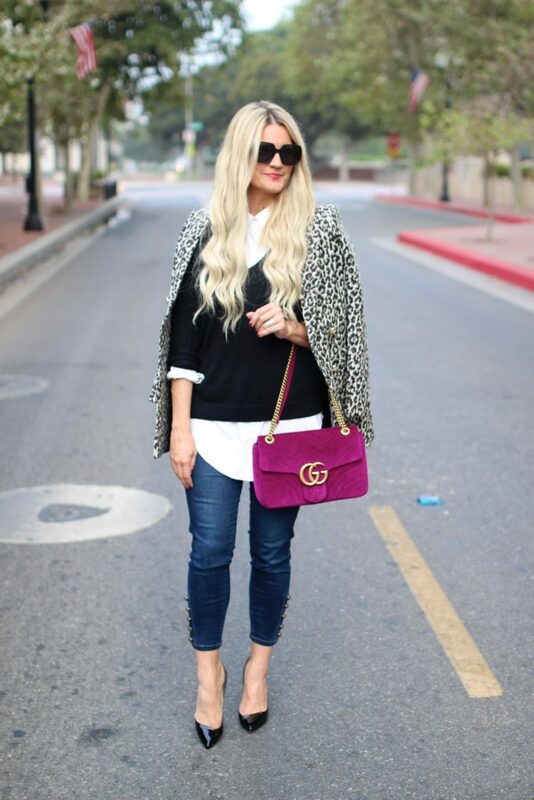 So true…a simple outfit turns instantly glam with a leopard coat. What really makes this outfit pop though is that beautiful purse! Love this so much! Such a cute coat!! Your weekend sounds amazing. We were all about the fall related activities too. I really love animal print and have been seeing it everywhere so much lately.You look amazing in this outfit.So classy and polished. I totally agree nothing beats a leopard coat! So stylish!!! Leopard is making such a huge comeback this fall- you are right on trend, babe! Sounds like you had a fun filled weekend. I agree animal print is a cool statement piece. I love the color of your bag! 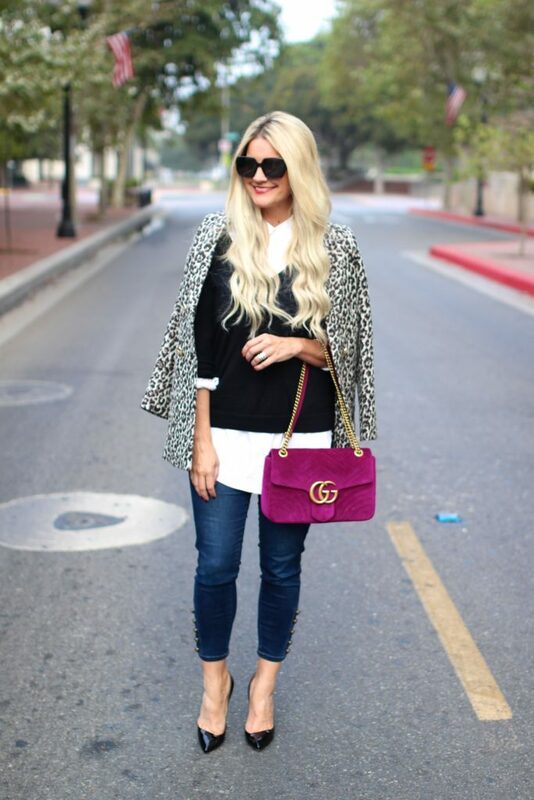 I’m loving your leopard coat, and what a gorgeous color bag! I need to add a few leopard pieces to my wardrobe this fall. So in love with this bag babe!!!! The color is … OMG! I have the black one but I need yours too!! Loving this look! It’s perfect for the fall. And that bag is to die fooor! i love the leopard trend so much and would love to get myself some leopard boots. Oh that jacket is all kinds of fabulous. And it looks amazing on you! Leopard print is just such a fun print to wear. By the way, your fall decor sounds amazing! I love this fun look so much! I can’t get enough of leopard print lately! This is absolutely a fab fall look dear! You really can’t go wrong with leopard prints, such a classic print. Also, your bag pops out beautifully. You are looking so ready for fall here, and I’ll never get over how gorgeous your bag is!